user warning: Expression #1 of ORDER BY clause is not in SELECT list, references column 'hotkilns_live.n.created' which is not in SELECT list; this is incompatible with DISTINCT query: SELECT DISTINCT n.nid, n.vid, n.title FROM content_field_knowledgebase_actions nr INNER JOIN node n ON n.vid = nr.vid AND n.status = 1 INNER JOIN node_access na ON na.nid = n.nid WHERE (na.grant_view >= 1 AND ((na.gid = 0 AND na.realm = 'all') OR (na.gid = 0 AND na.realm = 'content_access_author') OR (na.gid = 1 AND na.realm = 'content_access_rid'))) AND ( nr.field_knowledgebase_actions_nid = 1185 )ORDER BY n.created DESC in /home/hotkilns/public_html/sites/all/modules/nodereferrer/nodereferrer.module on line 428. Some of the bricks that need to be replaced will need to have holes drilled in them in the field. These holes cannot be drilled in the factory because the alignment would not be perfect. To drill peepholes use a 1" diameter drill bit or hole saw. One can also drill with a smaller bit then file out with a round hasp type file. In all cases the peephole must be drilled perpendicular to the stainless case. 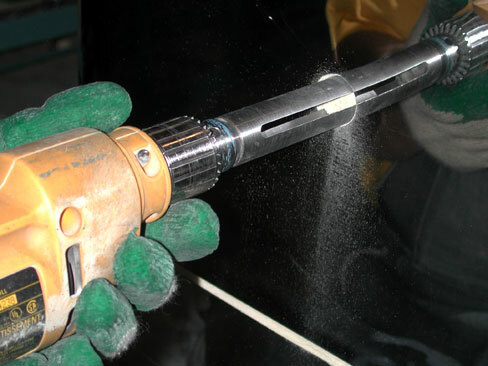 It may be necessary to remove the bit several times and clean it out as you drill deeper. It may be a good idea to have someone watch from the side to ensure that you are keeping the drill perpendicular. Drill slowly through the firebrick using the prepunched hole int he stainless steel. Measuring from the top of the brick into the top of the existing hole in the stainless steel case will show where the top of the drill bit will protrude. Adjust your angle of drilling accordingly.